The Muda Board is a durable solid grey graphic board made out of 100% post-consumer wastepaper designed to serve a variety of industrial purposes, such as the publishing, stationery, packaging, etc. Muda Board’s smooth, flat and firm finish ensures excellent and durable product results regardless of whatever application. The evenness and consistency also enables its trouble-free processing, whilst its absorptive properties allow swift and economic adhesion. 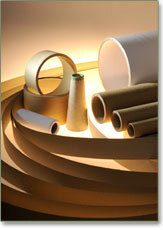 The range of Muda coreboard products is designed for the core winding industry. Prompted by decades of exceptional paper-making experience, our technical specialists are skilled in developing high-performance coreboards that serve the distinctive purposes of each individual customer. Our coreboard is a high-strength quality product that ensures reliable consistency and outstanding performance to the end-users, who demand on high plybond levels and crush resistance. Corrugating Medium (the fluted center layer of a corrugated box) produced by our paper mills with specialist knowledge in supporting the corrugated containers industries, for four decades. Our product has been fulfilling the high-performance and demanding container applications for the major international industries pioneers, who demand nothing less than the best.